Inhibits Biologic Growth Inside Humidifiers.� A Must To Help Keep Your Fogger Clean! 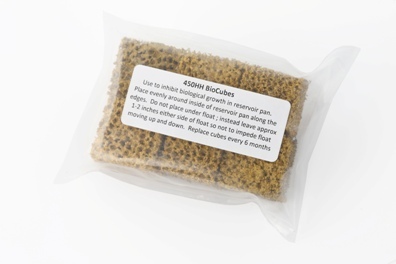 Our BioCubes are designed to inhibit bacterial growth in the reservoir pans of both Hydrofoggers and Minifogger. Each cube or cylinder is approximately 1"x1"x1" and contains dissimilar metals. These dissimilar metals create a redox effect that is very detrimental to biological activity. This creates an environment in your fogger that will help prevent bio-slime and keep your fogger cleaner longer. It also will help control odor-causing bacteria and unsightly mold in the fogger. Simply space all six pieces evenly around the inside perimeter of your reservoir pan (like numbers on a clock). Do not place the cubes under the float; instead leave a few inches on either side on the float so not to impede the float from moving up and down. Please note that our BioCubes will not eliminate calcium or other minerals from your water supply. These minerals must be removed by reverse osmosis (RO) water filtration. Finally, BioCubes are never a substitute for regular cleaning and maintenance of your humidifier--no matter who's humidifier you use. Shipped FREE with Hydrofogger or Minifogger Order.